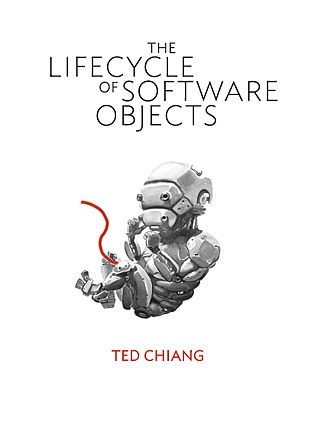 Ted Chiang’s short fiction (and it is all short, at 150 pages, his most recent novella The Lifecycle of Software Objects is his longest work to date) is marvellous stuff. Exquisitely crafted and never dull; his collection Stories of Your Life and Others is well worth reading (looks like it’s being republished, too). The Lifecycle of Software Objects follows the inception of and subsequent growth of a number of software-based intelligences. As such, there’s no particular plot to speak of. In fact, it’s pretty light on characterisation, too. The idea of the development of the artificial lifeforms is introduced to the reader through two main characters, Ana (who had been a zoo keeper until she was made redundant) and Derek, an animator. Both these characters take their skills to a software company which intends to construct artificial creatures (digients) which will grow and learn. Initially the company is successful – people are attracted to the idea of raising the artificial life-forms. Over time, however, it becomes clear that the commitment required from people is not one that most wish to make and the number of active digients decreases as people suspend theirs. A very few of the characters, however, (including Ana and Derek) choose to continue theirs and continue to raise them after the company that created them goes bust. Time passes, the digients progress through childhood, into adolescence, learning to rebel as they learn both responsibility for themselves, their actions and how they affect others. As the novella is constructed from a number of snapshots, Chiang doesn’t feel it necessary to do much more than to tell us that time has passed and that, for example, the software platform which the digients exist upon will be shut down and that they will not be able to survive as they were never programmed to live in the newer software environment that has replaced their previous home. Ana laughs. ‘What? Why do you want to get a job? ‘You need,’ he says, matter-of-factly. Despite this, as I say, there are touches and aspects of the digients that remind you that they aren’t children. Indeed, Ana frequently complains that people see her decision to look after animals and her career with the software based life as a substitute for a real family; she considers that they are not one and the same. Her care for the digients (or previously, animals) isn’t demonstrating any deficiency in her life. Something else, which I think demonstrates the great skill that Chiang possesses, is his ability to include Zeitgeisty references to any number of types of social media (whilst not being daft enough to any particular one) and not produce embarrassing or clunky prose. Though there is a human story in this novella, the real joy in this is following the idea that, for an artificial intelligence to truly work, it must be grown, and nurtured rather than programmed. I’m pretty sure that I’ve read novels where this is the case, but I can’t think of one where it was this central. At the start of the book, as when a child is born, the digients have some ideas of some of the constraints that there will be for the growth of the intelligence from their programming (perhaps analogous to, say, your social situation which may be a predictor of how you can expect aspects of your life to be) but beyond this, they really had very little idea about what they were going to create. One other thing that is worth commenting on is the artwork in the book. Wonderfully illustrated throughout, in two colours, it does feel like a real labour of love. Small, but perfectly formed – try and snap it up before it becomes unavailable. Available from Amazon (though perhaps not for long, Subterranean Press list it as sold out…). Subterranean do have it online, now, though. This entry was posted in Review and tagged mundane sf, novella, sf, ted chiang. Bookmark the permalink.